This article will provide you with information about eBay’s business policies and how to set them up in Kyozou. What is meant by eBay’s Business Policies? Business Policies is an optional configuration available to sellers on eBay. It allows you to pre-set a variety of different templates for your shipping, payment and returns policies. Why You Should Opt Into Business Policies? Enrolling into business policies and pre-setting your own templates will save you precious work hours when creating or revising your listings. Unlike legacy settings, where a seller would need to specify these settings from scratch for every listing created, eBay Business Policies allow you to quickly specify a pre-set template for your listings, resulting in an, overall, easier and quicker listing management. More info from eBay could be found here. How to setup Business Policies Within Kyozou? In case your eBay seller account isn’t enabled yet to use Business Policies, visit this link to opt in. Setup of new business policies (pre-sets) or updating existing ones can be done directly from Kyozou. In case you do not see such an option in your control panel, refresh your eBay account settings within Kyozou by renewing your eBay token and try again. Instruction of eBay token renewal can be found HERE. Apply Your Business Policies to Products and Listing. 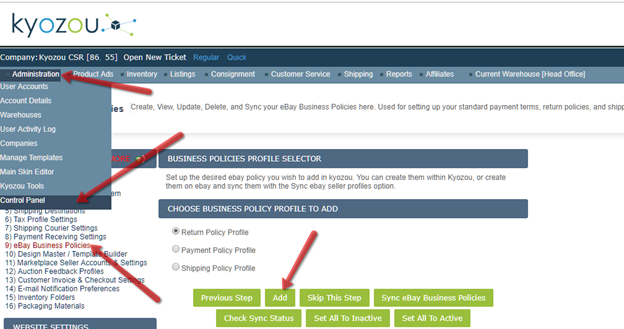 Use Kyozou’s product settings to apply your business policies to your listings. When using Multi Lister settings for your eBay listings, this setting should be configured within the Multi Lister settings. Any legacy settings for shipping, payments and returns will be overridden by selecting business policies. To apply business policies settings to your products in Bulk, use Kyozou’s Products Ads or spreadsheet options. Revise any currently active listings to apply the new policies. Important Notes Regarding Business Policies. Business Policies settings are unique per seller account. If you have more than one eBay seller account, repeat this process for each of your accounts. eBay has recently introduced a policy change regarding business policies. If your eBay seller account is enrolled, you are now required to use Business Policies exclusively on all of your listings. Any listings containing legacy settings will now be considered by eBay as non-compliant and will be rejected. In case that you require further Assistance, feel free to connect with your Kyozou customer success manager.